Pra Leelah Tung Setti from Wat Thep Sirin was created in BE2507, in conjuction with Bangkok Bank charity drive to raise fund for Wat Wanggrayoh Nakonahyok. The amulets were given free to hose who had came for the charity drive. This amulet was created by the abbot of Wat Thep Sirin, Jow Kon Udon Sahasohpon. After receiving the amulets during the charity drive, many people asked who was the monk that chanted this Pra Leelah Tung Setti. The reply at that time, was that the amulets were chanted by an Ah Jahn. One year later in BE2508, Jow Kon Noh became famous, after he started to create and chant amulets for the public. The public came to know that the amulet Pra Leelah Tung Setti that had been given free in BE2507 was actually chanted by Jow Kon Noh himself alone. There are 2 pims in this batch of amulet; Pim Yai and Pim Lek. A total of 4000 pieces were created; Pim Yai 2000 pieces and Pim Lek 2000 pieces. Both the pims have the same design. At the front of this amulet is a Pra Leelah, origined from the old Pra Leelah amulet found in Gru Tung Setti, thus this amulet was named as Pra Leelah Tung Setti. At the back of the amulet, is a Yan Pakawan 3 chan (level) signifies the Triple Gem; Buddha, Dhamma and Sangha. The 1st level has a Pali word "Aa", 2nd level is 2 Pali word "Uu" and "Ma", 3rd level; a gold leaf pasted. There are 4 other Pali words below the Yan Pakawan which are "Na"(Earth), "Ma"(Water), "Pa"(Wind) and "Ta"(Fire) which represent the 4 elements of the nature. 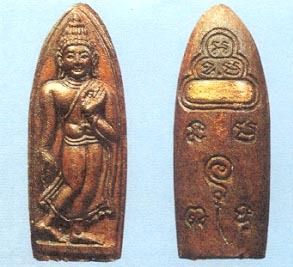 The amulet measures 4.6 cm and 1.9 cm for Pim Yai, for the Pim Lek is 3.5 cm and 1.5 cm. The colour of this amulet is red as it was mixed with old Pra Leelah amulets from Gru Tung Setti with Wahn(herb) materials. At one time, this batch of amulet was so popular and in high demand that it's price was more expensive than Somdej Lang Uu (the most expensive amulet of Jow Kon Noh now). The average price of this amulet now is around 10,000 to 15,000 bahts. This amulet is hard to find, whoever find it would keep it and would not let go. Majority of the amulets were collected by his disciple of Jow Kon Noh who had donated in the charity drive. Be careful when collecting this amulet because fake ones already exist for 20 years and look very similar.